Ceviche is a dish of South American origin where fish or shellfish is treated with acidic fruit juices, rather than cooking it. The acid softens and flavours the fish. Obviously, your fish has to be very fresh for this to be acceptable. For my version, use cooked and peeled prawns (in a packet from the supermarket). No claims for authenticity, but very tasty nevertheless! Ingredients for cooking Ceviche Finely slice a couple of shallots and one small hot chilli (removing the seeds). Also, wash and chop some fresh coriander leaf - remove the leaves from the stalks before chopping. Wash the prawns and place in a bowl. Add the shallots, chilli and coriander. Squeeze the juice from two or three limes and pour over the prawns - there should be enough juice to cover all of the fish. Stir well, then cover with clingfilm and put in the fridge for twenty minutes. I like to serve this dish with boiled sweet potatoes. Simply wash, cut in half and boil in salted water until soft all the way through - about 25 minutes. The bland taste of the potato works well with the sharp acidic taste of the ceviche. 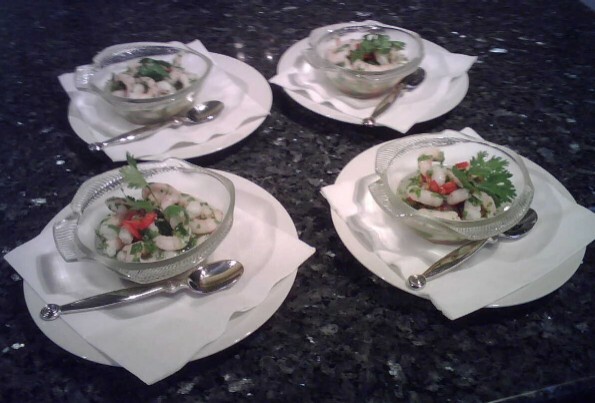 To serve, divide the ceviche into four small bowls, and place each bowl on a plate. Put a half sweet potato (still in its skin) on the plate. Use small spoons (teaspoons) to scoop out the potato and eat with the prawns.